I think Claire Nowak did a great job outlining the different schools of thought on this “diet” in Reader’s Digest Online. I have pulled out my quotes (below), but you can click on the picture below to read the full text. What do you think? 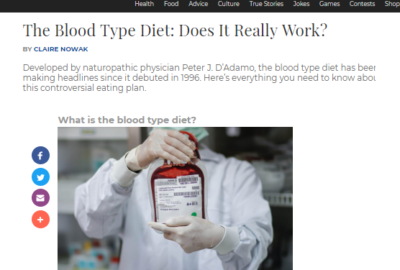 Dr. Charlie Seltzer, MD, calls the blood type diet a “parlour trick,” but doesn’t consider the diets overtly unhealthy.